A dental implant is a titanium tooth root that takes the place of a natural tooth root. When a patient suffers from the loss of a tooth or several teeth, the placement of dental implants creates a new smile as strong as nature’s original work. The dentist places a titanium tooth root into your jawbone, and your body’s bone tissue will fuse with the titanium to create a solid, reliable prosthetic tooth root. Stage I is when the dental implant post is placed in to the jaw bone to replace the missing tooth’s root. 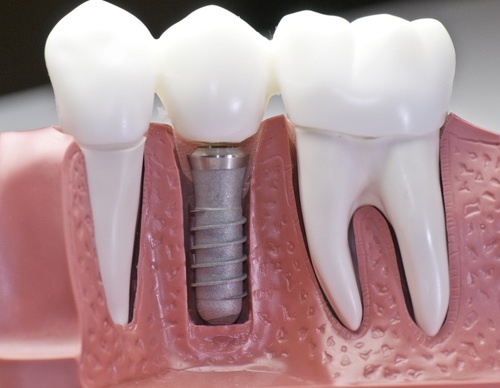 A natural process which is called Oseointegration then occurs over the following 3 months allowing the jaw bone and implant to integrate together, with the bone naturally regenerating around the implant threads to become strong. A dental implant can be placed in just 20 minutes and if several implants are required, then multiple dental implant placement happens on just one treatment session and the time taken depends on the amount of implants needed. Stage II, three months later, the patient is ready to finish the procedure and place the implant abutment and crown in just 2 short appointments, normally 3 days apart.